Versatile Thread Impression - EachOur line of Erico Electrical and Datacomm Fasteners are perfect for those big contractors running thousands of feet of cable. Or someone just doing a few home improvements. Whoever you are, Erico Electrical and Datacomm Fasteners are the right choice for you. The new CADDY MPVTI is a Versatile Thread Impression for low voltage applications where an electrical box is not required. Since the MPVTI provides a single thread impression, it can be used in multiple quantities to support multi-gang devices. Size and shape are no longer an issue. The CADDY MPVTI fits common dry wall sizes of ½" and 5/8". This one support product can be used for dozens of different drywall applications, thereby reducing stock and tool requirements. 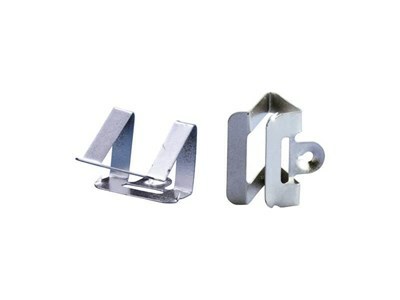 Simply attach the CADDY MPVTI to the drywall opening edge at the mating point of the device screws. It features a serrated grip surface, which provides quick, secure installations. Support point for speakers, audio/video/security panels, EXIT signs, etc. Ideal for supporting a wide variety of low voltage devices including speakers, audio/video/security panels, signs, etc. in drywall.